Somebody in our office ate noodles. I can tell because of its unique smell. I felt hungry and suddenly got myself craving for a Yakisoba noodles. So, I went to 7-11 and bought one for P32. I poured hot water and waited for it to cook for about 3 minutes. Then, I mixed the sauce provided. The taste was good enough, savory beef it is. It filled my empty stomach. I was just quite disappointed with its mouthful content, it left me wanting for more. But then, overall, I was happy. 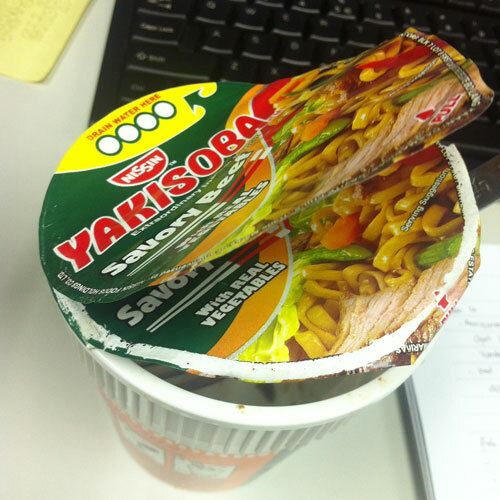 This entry was posted in Daily Me, Food Corner and tagged break, food, yakisoba. Bookmark the permalink.